A first-of-its-kind Pasco County program is helping high school students hoping to become firefighters. 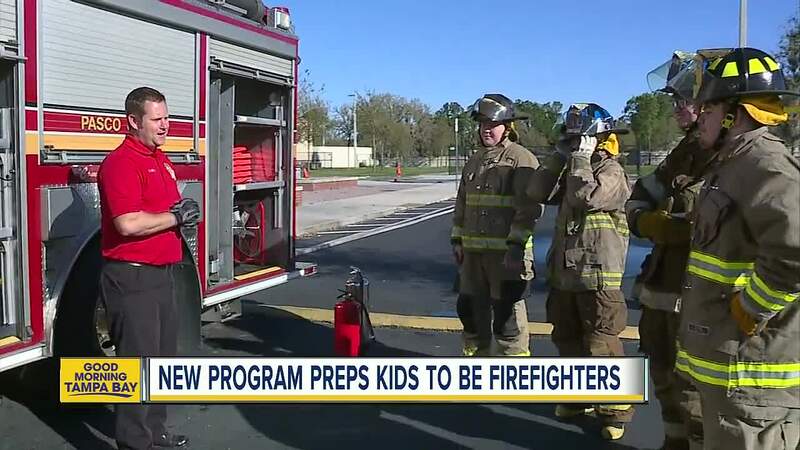 PASCO COUNTY, Fla. — A first-of-its-kind Pasco County program is helping high school students hoping to become firefighters. "Last year, my step-dad brought me to a live burn at the training center and it really sparked my interest," said Amy Newland. For students like Newland, the "Fire Science Course" at Fivay High School is the perfect way to start climbing the ladder. She eventually wants to become a battalion chief. "It's a great jump start for the students and allows them an opportunity to start early," said Mike Sherwin. Sherwin is a full-time Pasco County Firefighter. He also now teaches the Fire Science Course at Fivay High School with two other instructors, Chief Shaun Whited and Mark Moe. The program has classroom work, but the real focus is on gloves-on training with real equipment. Instructors teach life-saving skills and give them vital information about fighting fires, like how to pull a hose and use the firetruck. “The hardest part [to me] is pulling hose because sometimes I can’t get it off because I don’t have the strength," said Newland. "I am still working on that, but I’ve already seen improvement since I started the course." "For us in the fire department, as a community, we are teaching our young people here and putting them into our workforce," said Sherwin. Sherwin explains he and his fellow instructors teach Pasco County students to encourage them to stay local and join Pasco County Fire Rescue. "Whether they end up in the fire service or not, it gives them an opportunity to learn skills outside of what is normally taught in high school," said Sherwin. When students pass the program, Sherwin explains they gain their "Fire 1 Certification," which helps them fast track at places like Pasco-Hernando State College after they graduate.